Model-based medical decision support in terms of computer simulations, predictions and optimization gains increasing importance in health care systems worldwide. This work deals with the control of the glucose balance in intensive care unit (ICU) patients providing nutrition and insulin. The basis of the investigations is the bio-medical model GlucoSafe by Pielmeier et al. (Comput. Methods Programs Biomed. 97(3):211-222, 2010) that describes the temporal evolution of the blood glucose and insulin concentrations in the human body by help of a nonlinear dynamic system of first-order ordinary differential equations. This paper aims at the theoretical analysis and numerical treatment of the arising optimal control problem. Numerical results demonstrate the controllability and applicability of the model, in particular critical hyper- and hypoglycemic initial states are considered. Glucose is the major carbohydrate fuel of the human body. Blood glucose refers to the amount of sugar (glucose) circulating in the blood. The human red cell and brain depend entirely on the blood glucose for the energy metabolism, about 80% of the human body’s daily glucose consumption (in total about 200 g) is due to these cells . The maintenance of a normal concentration of blood glucose (5 mmol/l; 100 mg/dl) - i.e. only one-fifth of a teaspoon of sugar in a liter of blood - is essential for survival. When the blood glucose decreases to less than 2.25 mmol/l, hypoglycemia (low blood glucose) develops and compromises the brain function, leading to confusion, disorientation and possibly life-threatening coma. Hypoglycemia poses an immediate threat to life , on the other hand persisting hyperglycemia (high blood glucose) with concentrations greater than 6.25 mmol/l puts a human at risk for renal, vascular and eye diseases. The anabolic hormone insulin plays a key role in the regulation of the blood glucose. In healthy individuals with a normal insulin response glucose levels are relatively stable and average at different times of day at 5-6 mmol/l with a standard deviation of about 0.8-1.0 mmol/l [3, 4]. But patients who are critically ill are often insulin resistant, i.e. a given amount of insulin produces a less than expected response. So, more insulin is required in a critically ill state to cause the ‘normal’ effect. In intensive care units (ICUs) worldwide it has become standard practice - also for nondiabetic patients - to measure blood glucose concentrations frequently (mostly using measurement intervals of 2-3 hours for nondiabetics) and to administer insulin by infusion or injection if the patient is hyperglycemic (>7-8 mmol/l) . The glucose normalization in ICU patients is a desired goal, as studies have demonstrated that normal glucose levels with low variability (fluctuations) are associated with reduced mortality and less complications in the healing process, compared to hyperglycemic ICU patients . So far, clinical standard regulation procedures rely on the use of ad-hoc insulin protocols that are primarily based on experience. In combination with the unpredictable sudden changes in the insulin resistance that are typical for ICU patients  and/or with clinical modifications of the nutrition support, the protocol approach result in highly variable blood glucose levels being characterized by periods of hyper- or hypoglycemia and oscillations between these states . The risk of (life-threatening) hypoglycemia increases up to sixfold with these standard insulin protocols, and even for very tight (1 hour or less) measurement intervals the risk is significantly higher. Therefore, model-based medical decision support gains increasingly importance, see  and references within. There is a strong need for more rigorous investigations, long-time predictions and optimal control on basis of computer simulations that model-based medical decision support methods bring to this type of problem. Apart from the medical benefit also the socio-economic profit of a safe and efficacious glucose control in the ICU might be considerable. The United States’ spending on critical care amounts to 1% of its gross domestic product. Cost analysis studies in Europe and the United States estimate that 2,640 Euros or US$ 1,580, respectively can be saved per patient staying in the ICU with a tight model/simulation-based glucose control . This work deals with the optimal control of the glucose balance in ICU patients, regarding insulin therapy and appropriate food supply. The basis is the bio-medical model GlucoSafe developed by Pielmeier et al. . The temporal evolution of glucose and insulin concentrations is described by a nonlinear dynamic system of first-order ordinary differential equations (ODE) that is closed by a parameter estimate for the insulin saturation. We perform a theoretical analysis of the model (regarding existence, uniqueness) and propose an adequate and efficient numerical method. The simulation results demonstrate the controllability and applicability of the model. Thereby, we particularly focus on long-time predictions and the control of hyper- and hypoglycemic initial states, in comparison to measurements. A large randomized clinical study to test the described approach is in progress. The paper is structured as follows. Starting with a short introduction into the bio-medical problem, we formulate the optimal control problem as L 2 -minimization with ODE-constraints in Section 2. Sections 3 and 4 deal with the theoretical investigation and numerical handling, respectively. Simulation results for prognosis/prediction and optimization are presented and discussed in view of the medical circumstances in Section 5. We conclude with perspectives for future model extensions and modifications. Our goal is the optimal control of the blood glucose concentration in ICU patients using the supply of nutrition and insulin as control variables. The optimization is based on an ODE-model for the compartmental description of the glucose metabolism. Apart from insulin and nutrition also the activities of brain, central nervous system, liver, kidneys, gut, muscles etc. influence essentially the blood glucose. The temporal evolutions of the glucose and insulin concentrations in the human body are determined by a complex system of hormonal interactions and several anabolic as well as catabolic pathways involving a greater number of different substrates. 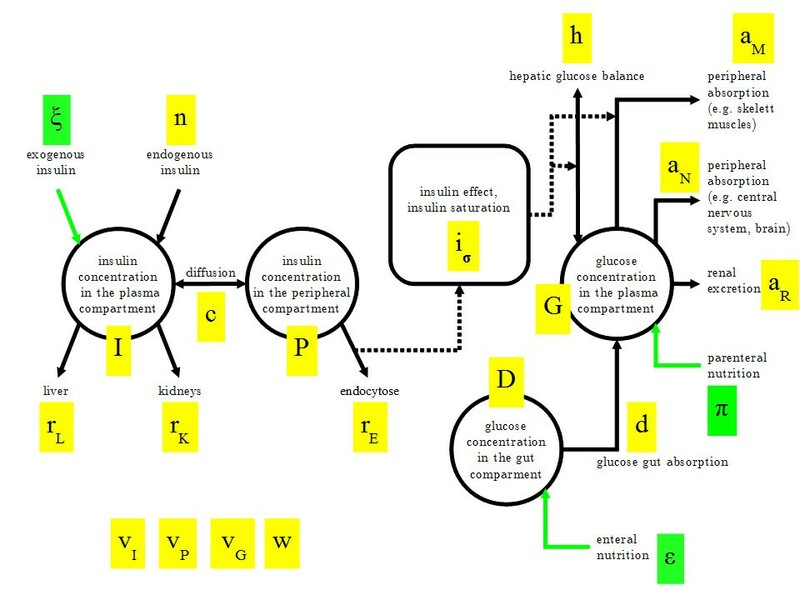 Taking into account all these interactions and reactions yields very complex descriptions of the glucose metabolism with many relations and parameters, some of them can neither be measured directly nor indirectly via observables. Hence, closure conditions and simplifying assumptions are required. The compartmental analysis is a typical approach to set up a simplified model, thereby the respective total concentration under consideration (glucose or insulin) is distributed in a small number of compartments where the concentration gradients are assumed to be constant. The fluxes into and out of each compartment are modeled by corresponding transfer rates . In such a framework, a two-compartment model (plasma and peripheral compartment) was developed for the insulin kinetics consisting of different appearance, clearance and diffusion processes in . The appearance and utilization of glucose are lumped in blood glucose and gut compartments . The model by Pielmeier et al. (GlucoSafe) brings the described compartment models for insulin and glucose together by introducing a linking nonlinear relation via the insulin effect on the glucose uptake, for a graphical illustration of the underlying considered processes see Figure 1. From a bio-medical point of view the pharmacodynamic effect of the insulin is not fully explicated yet , although the saturation result at high insulin concentrations is well-known. Under normal conditions (for healthy persons) the saturation of the insulin effect on the glucose uptake is of no matter. However, for ICU-patients of whom the majority is insulin-resistant to some degree and receives exogenous insulin (by injection/infusion) to increase the body insulin concentration, the saturation of the insulin effect is of great importance . This is not least due to the fact that insulin at a saturated level ceases to be a control tool for the regulation of hyperglycemia. The GlucoSafe model was developed for the specific use in critically ill, artificially nutritioned patients. It considers an exogenous insulin transfer rate that accounts for external insulin infusions or injections, as well as enteral and parenteral nutrition rates for the artificial food supply by help of a gastric tube or an intravenous access. The endogenous (body’s own) insulin is assumed to be constant since the normally glucose-dependent insulin production is often defective in critically ill patients. Illustration of the bio-medical model and its quantities . The state is the blood glucose concentration G, the controls are the exogenous insulin transfer rate ξ as well as the enteral ε and parenteral π nutrition rates, i.e. u = ( ξ , ε , π ) (highlighted in green). and appropriate initial conditions. The state variable (to be controlled) is the glucose concentration in the blood plasma G. Further states are the respective concentrations in the other compartments, i.e. the glucose in the gut D as well as the insulin concentrations in the blood plasma I and around the cells (the so-called peripheral compartment) P. Between the last two a difference-based decay process takes place. The controls are the intakes/medication of exogenous insulin ξ as well as of enteral ε and parenteral π nutrition, which we summarize as u = ( ξ , ε , π ) . State and control variables are certainly nonnegative time-dependent functions. The glucose balance of the liver h as well as the glucose absorption from the gut content d, of the skeletal musculature a M , brain and central nervous system a N are modeled as patient-independent continuous differentiable functions, in contrast to the continuous differentiable renal glucose excretion a R that depend on the patient data (body weight w, height, age, gender and diabetic status). Further patient-dependent, but temporal constant parameters are the rate of the insulin reduction in liver r L , kidneys r K and in the process of endocytosis r E , the insulin diffusion constant c between plasma and peripheral compartment as well as the volumes of glucose blood plasma v G , insulin blood plasma v I and peripheral compartment v P . As mentioned, the endogenous (post-hepatic) supply of insulin n is considered here as a patient-dependent constant. The effect of the insulin on the glucose intake enters (1) by the quantity i σ . Since the understanding of this biological process - involving impact sensitivity and saturation effect - is still rather limited, i σ is expressed in terms of a nonnegative parameter tuple σ ∈ ( R 0 + ) 2 . It turns out that this tuple has to be adapted frequently to ensure reasonable predictions of the temporal blood glucose evolution, see Section 5. We use a least-square parameter fit where the deviation of the simulation results (1) to earlier measurements is minimized, i.e. min σ ∈ [ 0 , 1 ] 2 ∑ i ∈ I ( G ( t i ; σ ) − G ˆ i ) 2 . Here G ˆ i denotes the measured blood glucose value at the discrete time point t i and G ( t i ; σ ) is the corresponding numerical result computed in dependence on the parameter σ, in particular i ∈ I ⊂ N 0 , I ≠ ∅ is considered. For further explanations about the underlying bio-medical processes and respective closure relations to (1) we refer to . Remark 1 Alternatively to (2) one might also think about a weighted fit where recent measurements are considered to be of higher relevance for the insulin effect adaption than older ones, . However, the data set is relatively small because the typical measurement intervals due to clinical standards are 2-3 hours and the insulin effect changes over the day. Practically, only 2-3 measured values (within the last 6 hours) are taken into account in (2) (see Figure 3 in Section 5). Note that only the blood glucose G can be measured, but not D, I and P. This makes the initialization of (1) at a certain time t 0 inexact. In combination to the measured blood glucose G ( t 0 ) = G ˆ 0 , reference values for D, I, P at t 0 might be taken from literature . The initial perturbation that is carried into the system decreases over time due to the asymptotic stability of the ODE-model, see Section 3. During the course of a medical treatment previous simulation results are used as better initial guesses. For the parameter calibration of σ in (2), the same initialization procedure is applied, only with the exception that (1) is solved backward in time to yield G ( t i ; σ ) in the past. min ( G , u ) ∈ Y × U J ( G , u ) subject to G = G ( u ) satisfying the ODE-system (1) and u ∈ U being the set of admissible controls . where G ∗ is the desired blood glucose concentration and u ∗ is the desired control based on bio-medical and economic reasons with weights κ ∈ ( R 0 + ) 3 . The control space is specified in the following. The optimal control problem for the blood glucose stated in (3) can be embedded in the well-established theory of ODE-constrained optimization problems. Since the theoretical investigations can be performed by help of standard techniques [18, 19], we restrict ourselves to the presentation of the analytic results, omitting the respective derivations. In addition, we specify the space of admissible controls . 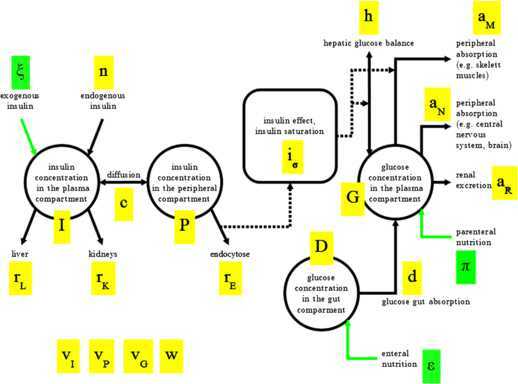 The underlying initial value problem (1) for the glucose metabolism is well-posed in the sense of Hadamard, i.e. there exists a unique solution that depends continuously on the initial conditions. For continuous controls the initial value problem is solvable in the classical sense. Existence and uniqueness of the solution are given according to the Picard-Lindelöf theorem for the sufficiently smooth model functions on the right-hand side of (1). However, bio-medical reasons require in general the use of noncontinuous controls. Considering u ∈ L ∞ ( T , ( R 0 + ) 3 ) , the system (1) has got a unique nonnegative solution in the sense of Carathéodory for every choice of nonnegative initial values. This stands in accordance with biological demands (i.e. nonnegative state and control variables). In the following, we consider the space of piecewise constant nonnegative bounded functions as set of admissible controls . This is reasonable and sufficient for the application regarding insulin and food supply via infusions. Moreover, the structure of the dynamic system allows the decoupling into a linear system for I and P, a Riccati equation for D and a nonlinear equation for G. The differential equations for I, P and D posses explicit solution formulas for the chosen control space . However, due to the required very technical case-by-case analysis the formulas are quite lengthy and omitted here, see . Furthermore, for each steady state G ¯ > 0 there exist a constant control u ¯ ≥ 0 and steady states I ¯ , P ¯ , D ¯ ≥ 0 , so that all together satisfy (1). It can be shown that this solution is asymptotically stable in all medically relevant cases and for all possible patient data. So, the controllability of arbitrary stationary states is possible in . The existence of optimal controls in the space L 2 ( T , ( R 0 + ) 3 ) can be proven straight forward for (3), following the ideas and procedure prescribed in . Uniqueness is lacked due to the nonlinearity of (1); however, this is not necessary from a user point of view. 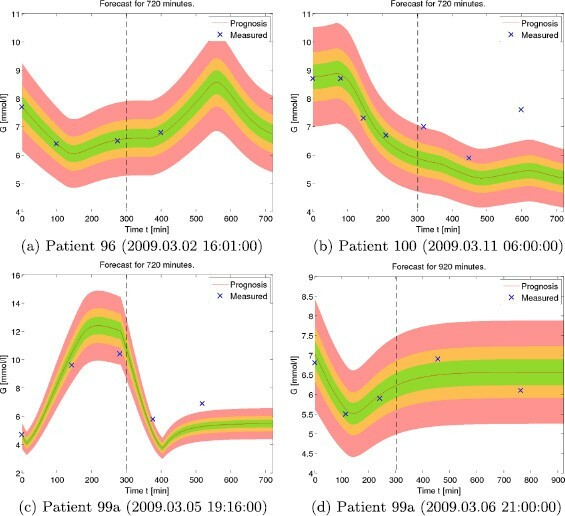 The medical decision support in ICUs requires an efficient numerical handling of the optimal control problem in view of computation time and accuracy. Therefore, it is advantageous to consider the associated equivalent reduced problem min u J ˜ ( u ) , J ˜ ( u ) = J ( G ( u ) , u ) . To solve ODEs efficient techniques have been developed, [20, 21]. As the GlucoSafe model (1) is not stiff, the numerical computation can be performed by standard explicit Runge-Kutta methods. We use the Dormand-Prince method (DOPRI) to calculate fifth- and fourth-order accurate solutions. The difference between these solutions is considered as error of the (fourth-order) solution and integrated in the adaptive step-size control . The computational effort can be even reduced by a factor of two when the analytical solution formulas for D, I, P are used for the calculation for G.
The optimal control problem (3) can be approached by direct and indirect methods . Testing various of them we have compared conditional gradient method, gradient projection method and Newton-type methods as indirect methods with the direct SQP-method. Regarding accuracy and computational efficiency, the indirect methods cannot compete with the direct one for this special problem (3); they are slower by a factor of about 50. Hence, we use the SQP-method with numerically calculated gradients  in the following. Remark 2 Note that the SQP-method is also applied to the identification of the parameter σ in the insulin effect quantity i σ , cf. parameter calibration/fitting problem in (2). Remark 3 The implementation is realized in MATLAB, version 7.7. Thereby, we use the MATLAB routines ode45 and fmincon for the Dormand-Prince method and the SQP-method, respectively. The adaptive step-size control of the ODE-solver meets absolute and relative error tolerances of tol abs = 10 − 12 and tol rel = 10 − 9 . The optimization is run with the termination criteria: 10 , 000 function evaluations, 500 iterations and tolerance for variable/cost function of 10−12 for the following numerical results. We demonstrate the controllability and applicability of the GlucoSafe model. Therefore, we firstly compare long-time predictions with measurements and discuss the effect of the insulin on the glucose intake. Then we show optimization results and recommendations for the medical treatment of hyper- and hypoglycemic states. The underlying sample of patient data and measurements is provided by the glucose research group at the Center of Model-based Medical Decision Support, University Aalborg. In the following we present a selection of characteristic cases, see Table 1. ⋆juvenile-onset diabetes: 1, adult-onset diabetes: 2. Figure 2 illustrates long-time predictions of the blood glucose concentrations over 12 hours for different patients. Comparing with the actual measured values the GlucoSafe model yields meaningful results. From the bio-medical point of view the agreement is very satisfying since the measured values lie in general in an acceptable area of 5% deviation around the prognosis (green zone) for the first 5 hours. Then the deviation tends to increase. The reason for the worsening is the time- and patient-dependent insulin effect that is realized by a single parameter identification at the beginning of the observation interval in these simulations. Figure 3 shows the cost functions K for the least square approximations (2) at the beginning of the observation for Patient 100 (Figure 2b) and after 5 hours (precisely at the measurement time point 320 min). The minimizer has obviously changed. Consequently, a frequent adjustment of the parameter tuple σ to measurements is necessary for reliable long-time results (cf. Remark 1). Moreover, it turns out that highly fluctuating blood glucose concentrations cause trouble as they can hardly be predicted by the simulations. Already in the first hours the deviations can go up to 20%, Figure 2c. Note that the same patient might have highly fluctuating as well as relatively stable concentrations in a little while (see Patient 99a, Figures 2c and 2d). For the health of the patient such strong fluctuations between hypoglycemic and hypoglycemic stated have to be avoided (stabilized) by help of an appropriate glucose control via food and insulin supply. Long-time predictions. Blood glucose measurements (blue cross) vs simulated prognosis (red line), the deviation areas of 5, 10 and 20% are colored in green, yellow and red, respectively. The cost function for the insulin effect approximation K ( σ ) , σ ∈ [ 0 , 1 ] 2 of ( 2 ) for Patient 100 (see Figure 2b) at different times. Left: at the beginning of the observation interval. Right: in the observation interval after 5 hours. The minimizer σ opt is marked by the white cross. : supply of insulin and nutrition. As admissible controls, we choose the set of nonnegative functions that are piecewise constant on an equidistant time grid of period size 60 minutes for Figures 4 and 5 as well as of period size 30 minutes for Figure 6. Their upper bound is due to medical restrictions (here: u≤ (0.35 U, 0.06 mmol/kg, 0.03 mmol/kg)/min componentwise). Control of hyperglycemic initial state, influence of diabetes type. Blood glucose concentration G, insulin rate, enteral nutrition rate, parenteral nutrition rate over time for the three control cases (Cases a-c are visualized as colored dashed lines, desired quantity as black solid line). Top: adult-onset diabetes (type 2), bottom: juvenile-onset diabetes (type 1). Control of normal (slight hypoglycemic) initial state. Blood glucose concentration G, insulin rate, enteral nutrition rate, parenteral nutrition rate over time for the three control cases (Cases a-c are visualized as colored dashed lines, desired quantity as black solid line). Control of drastical hypoglycemic initial state, influence of diabetes. Blood glucose concentration G, insulin rate, enteral nutrition rate, parenteral nutrition rate over time for the three control cases (Cases a-c are visualized as colored dashed lines, desired quantity as black solid line). Top: no diabetes (type 0), bottom: juvenile-onset diabetes (type 1). Figure 4 illustrates the control of a hyperglycemic initial state ( G ˆ 0 ≈ 10 mmol/l ). In all three control cases the blood glucose concentration is decreased to the desired level after the first hour. But it is interesting to see that the choice of controls differs. Allowing all kind of supplies, the insulin rate is exaggerated and combined with additional nutrition. Thereby, the use of parenteral nutrition affects the blood glucose directly (intravenous access) and yields the desired result at fastest. The recommended combination of insulin and nutrition provides a very stable blood glucose level for the next hours. 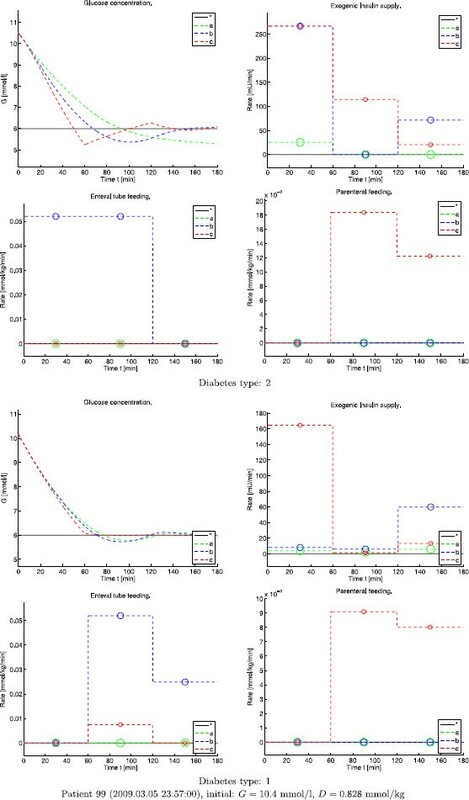 Studying the influence of the diabetes type (adult-onset diabetes in Figure 4(top) or juvenile-onset diabetes in Figure 4(bottom)) it turns out that the required supply is generally higher for adult-onset diabetes (type 2). Moreover, the blood glucose concentration is more fluctuating around the desired level as expected. However, this is not worth mentioning in view of the high oscillations that are in general observed in the traditional ad-hoc insulin protocol approaches at ICUs. So, the optimization results for hyperglycemic initial states are very satisfying and clearly differ (positively) from the ones of the ad-hoc approaches. Similar results are achieved starting with an already balanced blood glucose of 5-6 mmol/l, here the desired state can be even reached within 20 minutes (see Figure 5, Case c). Although ICU patients suffer mostly from hyperglycemia, we are also interested in the controllability and applicability of our approach for hypoglycemia. Figure 6(top) shows a very critical life-threatening scenario of a patient after a medical diet with a initial blood glucose level G ˆ 0 ≈ 2.5 mmol/l . As expected the exclusive insulin supply (Case a) provides no help for a nondiabetic person. But the other control strategies are successful in the glucose normalization. In analogy to the hyperglycemic problems, Case c yields the desired state at fastest within 20 minutes. But certainly the composition of the controls is different: the enteral tube feeding plays here the major role. The parenteral nutrition is just applied as support within the first 30 minutes in combination with a little rate of insulin. Without the intravenous access (Case b) it takes longer to reach the desired state (more than 2 hours). The results are reasonable and show again a very stabilized blood glucose level at the end of the observation interval without any fluctuations. Repeating the computations for diabetes type 1 yields comparable results, but the supplies of enteral nutrition and insulin are longer and higher (Figure 6(bottom)). Only the simulation of Case a raises questions as the exclusive supply of insulin causes an increase of the blood glucose concentration. This is unexpected and requires further investigations. A statistical validation of the numerical results is not yet possible due to the relatively small sample of measurements at hand. But the described approach has been implemented in a software tool at the Center of Model-based Medical Decision Support, University Aalborg that is recently applied and tested in a large clinical study. This paper presented a theoretical and numerical investigation of the bio-medical model GlucoSafe. 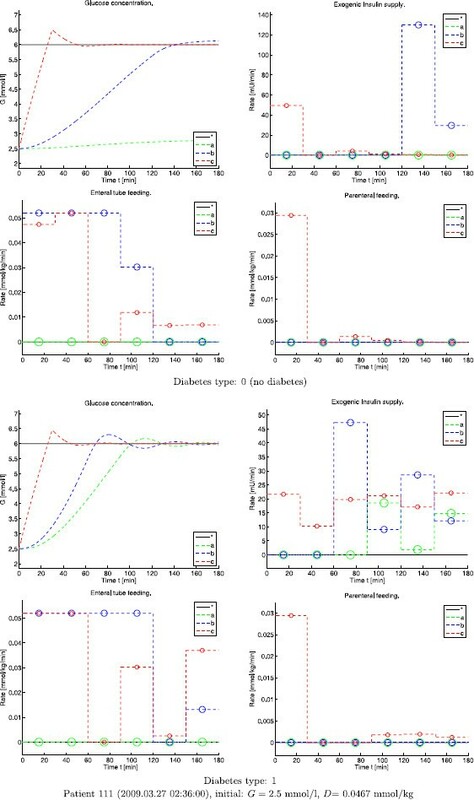 It shows the controllability and applicability of the model for the optimal control of the blood glucose concentration in ICU patients via the supply of parenteral and enteral nutrition as well as exogenous insulin. 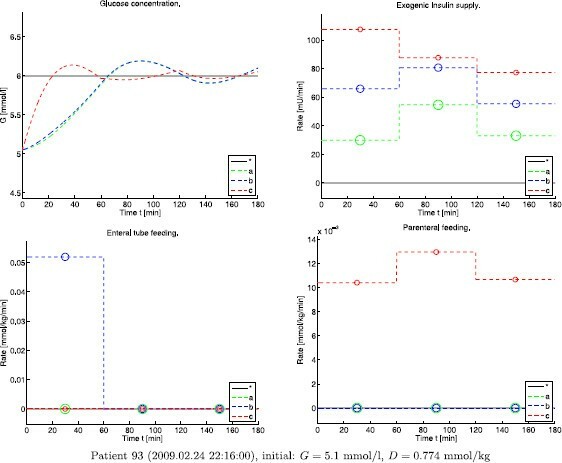 In view of long-time predictions and optimization (regulation) the simulation results are very convincing, in particular for ICU patients having a temporal relatively stable pharmacodynamic effect of the insulin on the glucose intake. Arising changes in the insulin effect are incorporated in the model by frequent parameter adaptions. A large randomized clinical study to test the described approach is in progress. Improvements of the model rely surely on a better bio-medical understanding of the insulin effect on the glucose intake, implying a concrete definition of the insulin function i σ . But also the modeling of the liver balance h as well as the endogenous insulin intake n being assumed to be constant so far pose open research questions to the bio-medical experts. The introduction of a glucose-dependent n would lead to a fully coupled dynamic system for all state variables. An interesting future task (from the bio-medical and mathematical point of view) is the consideration and incorporation of uncertainties coming from the patient data and the measurements. This results in a stochastic control problem for which sensitivity/robustness and controllability have to be investigated. The research team by Steen Andreassen, Center for Model-based Medical Decision Support, Aalborg University is acknowledged for providing a sample of patient and clinical treatment data. The theoretical and numerical investigations of the optimal control problem are due to NM and TC. SS run the final simulations with respect to patient and clinical treatment data. UP posed the problem (including the GlucoSafe model and the bio-medical demands on the optimization), provided data and supported the work with expertise from the field of application. All authors were involved in writing the manuscript.